Why All In UA Little Rock? 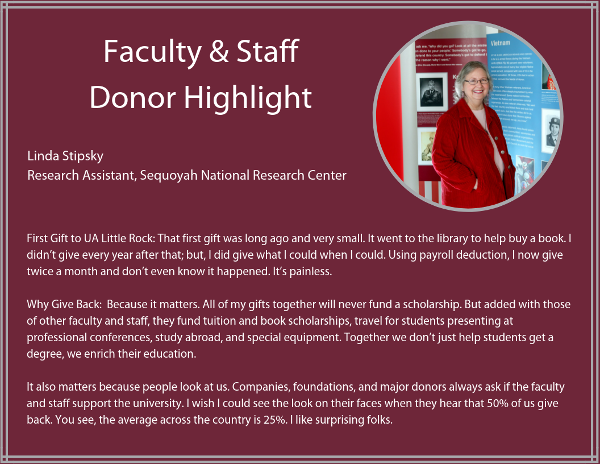 Simply put, your gift makes a difference right here at UA Little Rock. Many areas rely on our gifts to maintain services and develop and grow programs that support our students, our research, and our faculty and staff development. Equally important is that our support demonstrates to UA Little Rock alumni, friends, corporations, foundations and community partners that we believe in UA Little Rock and that it’s worthy of their support too. When the Campus Campaign began in 2001, 6.5% of the campus participated. In 2018, support was a generous 46% of all benefits-eligible employees. By choosing UA Little Rock, we are investing in ourselves and strengthening the university for current and future faculty, staff, and students. As we begin the new year and the 2018 Campus Campaign, we want to remind you that your participation in this year’s campaign starts calculating Jan. 1, 2019 and that every gift matters. Make the gift that makes sense for you. Giving to UA Little Rock has never been easier. Many faculty and staff choose to make a recurring gift by payroll deduction. Others make their gift online by charging their credit card online. 100 percent departments will receive cookies!